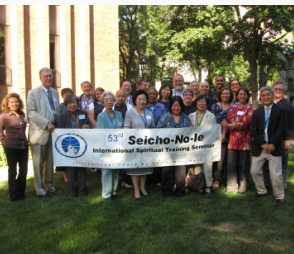 SNI International Spiritual Training Center / About Us / What Is Seicho-no-ie? Seicho-No-Ie (Say-choh No Ee-yay) means "The Home of Infinite Life, Wisdom and Abundance"
Seicho-No-Ie Truth of Life is a nondenominational movement based on the belief that all religions emanate from one universal God. It is dedicated to spreading the truth that every person is a child of God; therefore, in reality every person is divine in nature and possessor of all creative powers of God. Seicho-No-Ie was founded in Japan in 1930 by Rev. Masaharu Taniguchi, who, through his deep concern over the many contradictions in life, dedicated many years of intensive study to different philosophies and religions. Seicho-No-Ie's message is simple, direct, and it can change lives. People have the power to recover from various diseases, including cancer and tuberculosis. You can also find harmony and prosperity after listening to or reading the inspired teachings. Our lives are meant to be harmonious, joyful, and fulfilling in all aspects. Please join us at one of our upcoming seminars to learn even more about this wonderful teaching.